Talk about Italian pizza, US pizza, you can easily name out the restaurants and cafes that serve this. But how about French pizza? and where to get it? The answer would be FLAM’S. 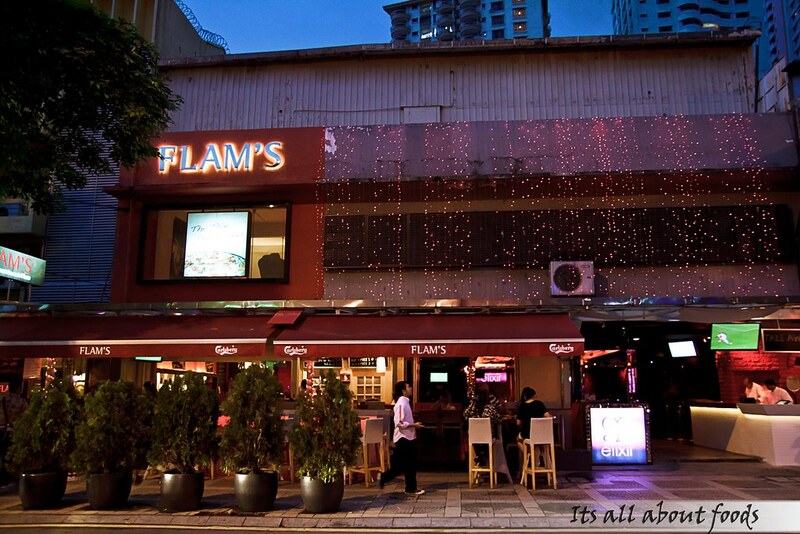 FLAM’S is a name of a restaurant at Jalan Changkat Bukit Bintang serving the traditional French pizza. 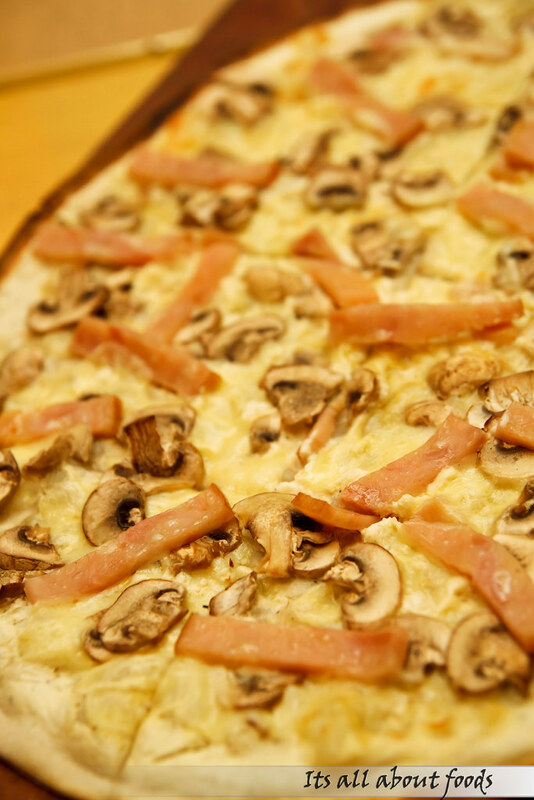 The name at the same time is also an abbreviation for Flammekuchen or what is known as tarte flambee, which is essentially a flat bread bake in high heat with toppings of cream cheese, onions and bacon. FLAM’S hails from the region of Alsace, where Sebastian comes from. Same as many other culinary greats, flam was a mistake that turned out to be a gastronomic legend that has preserved through many generations. Nowadays, flam restaurants are widely available in France and becoming a common dish among the society. 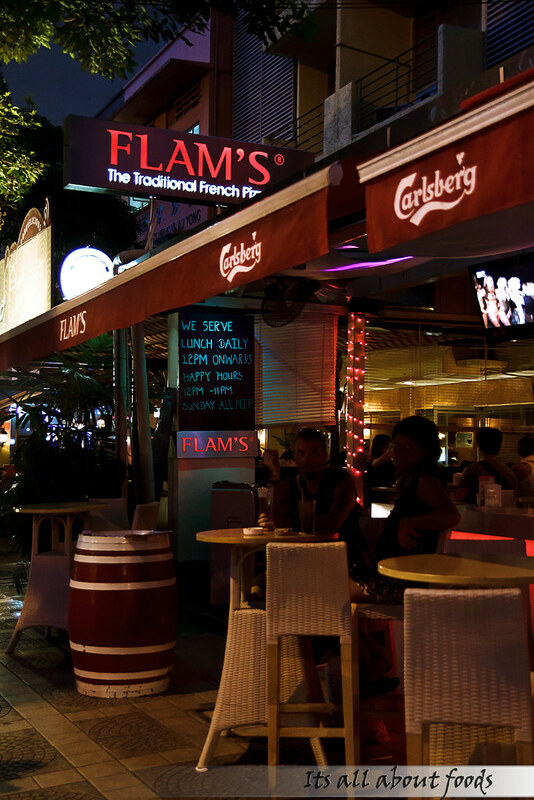 With the opening of FLAM’S in Malaysia, FLAM’S certainly top up the choice of food for Malaysians. 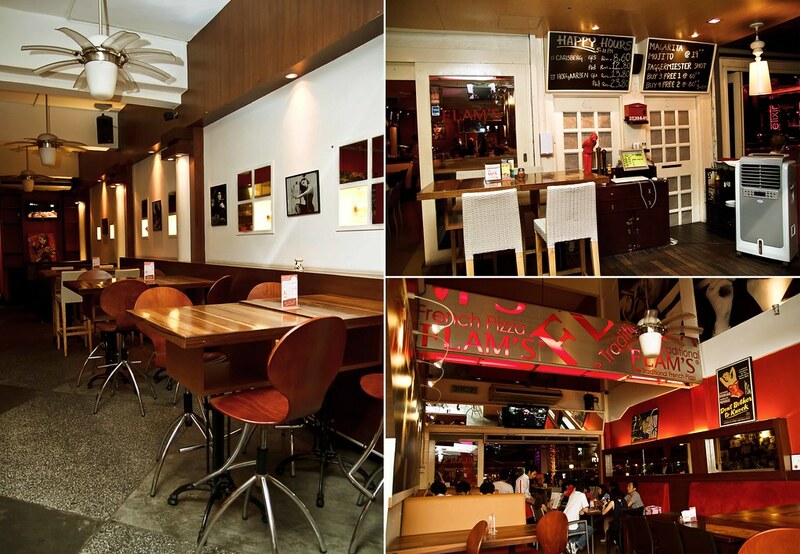 Dividing into indoor and outdoor, FLAM’S has a country style interior with white and red as background colour and wooden concept that makes it warm and cozy. A very nice place for gathering and celebrations. 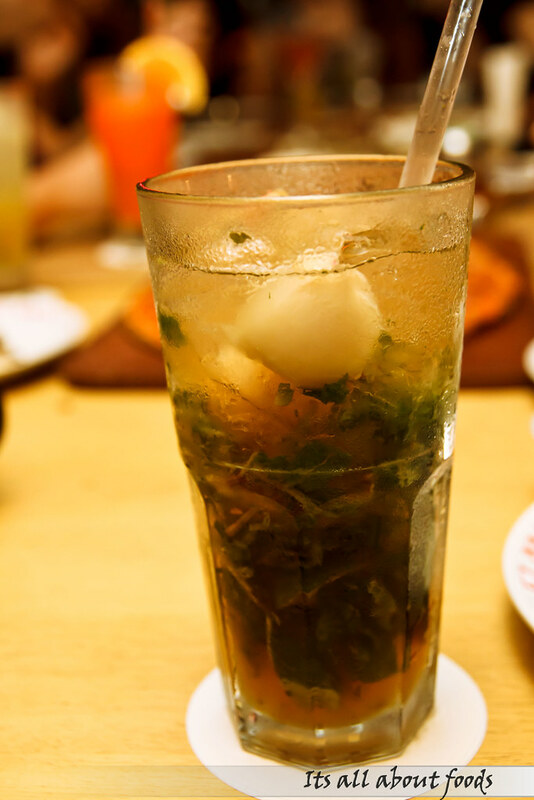 A glass of Mojito consists of Rum, mint leaf, fresh lime, brown sugar, lychee and soda water. 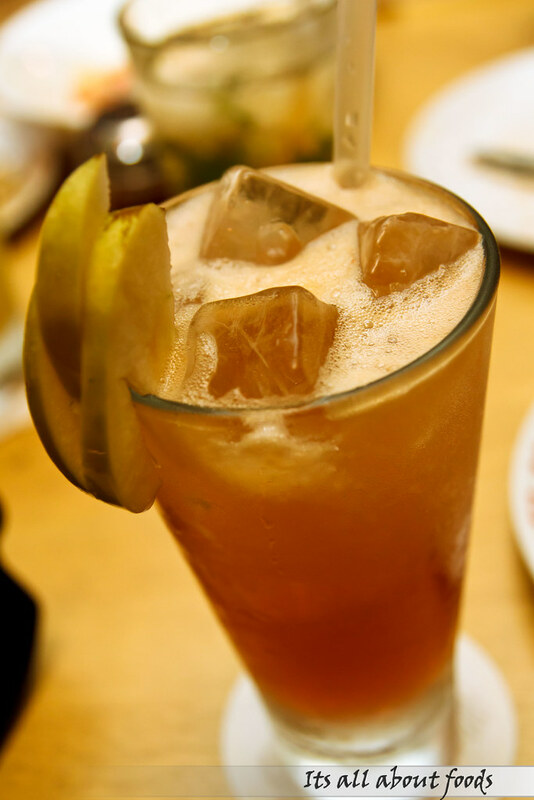 Slightly bitter and sweet with a twist of freshness from lychee, this prompt to be a unique and memorable drink. Sweet and light Cranberry Juice with apple and honey, a mild drink suitable for those who don’t take alcohol. 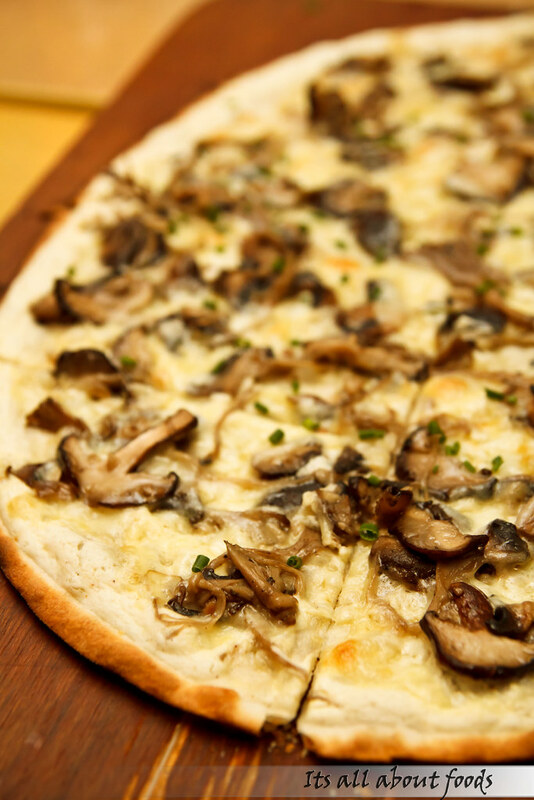 An old time favourite with thin flat bread topped with seasoned and glazed mixed fresh mushroom, a splash of secret oil, aromatic herbs, cheese, cheese, and more cheese.. Don’t worry, the cheese doesn’t make the pizza turned oily or heavy, instead the pizza is so flavourful and delicious with the aromatic mushrooms. Another excellence pizza from FLAM’S with flattened pizza in oval shape and loaded with turkey ham, mushrooms and mozerella cheese. The use of cream mixture instead of tomato base in FLAM’S has made their pizza tastes so unique and more creamy, while the preparation time of up to 10 minutes has indirectly making me to appreciate this good flavor pizza more. 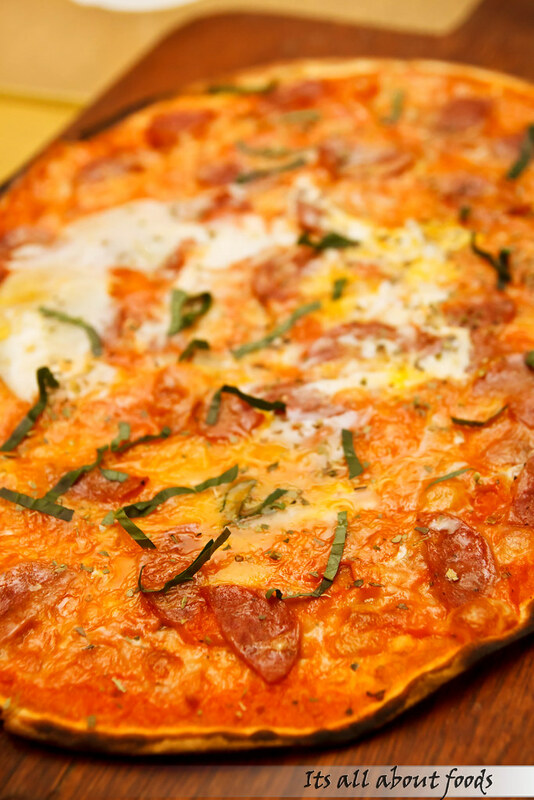 Pepperoni Flam’s is a flat bread spread with tomato sauce, topped with cheese, basil, spicy sausage, egg and oregano flakes. Chewy and crispy on the edge, the pizza has a intense taste, great in texture, and the topping of a runny egg makes the pizza oh-so-delicious and special. 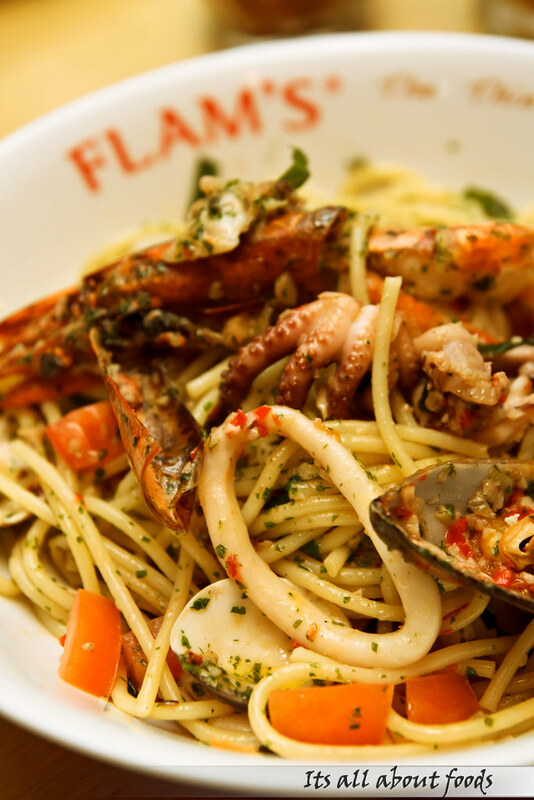 Other than pizza, FLAM’S also serves a variety of pasta that taste equally delicious. 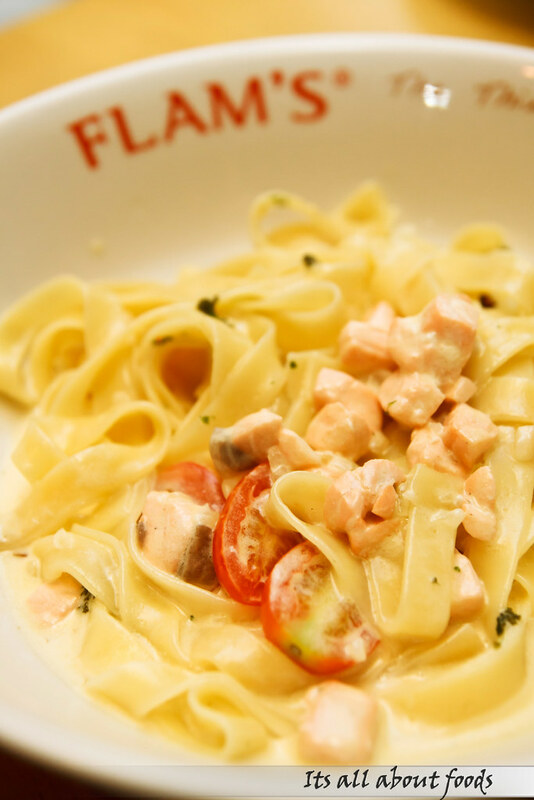 This al dente pasta has fettuccine tossed in cream sauce, Norwegian salmon and fresh tomato. 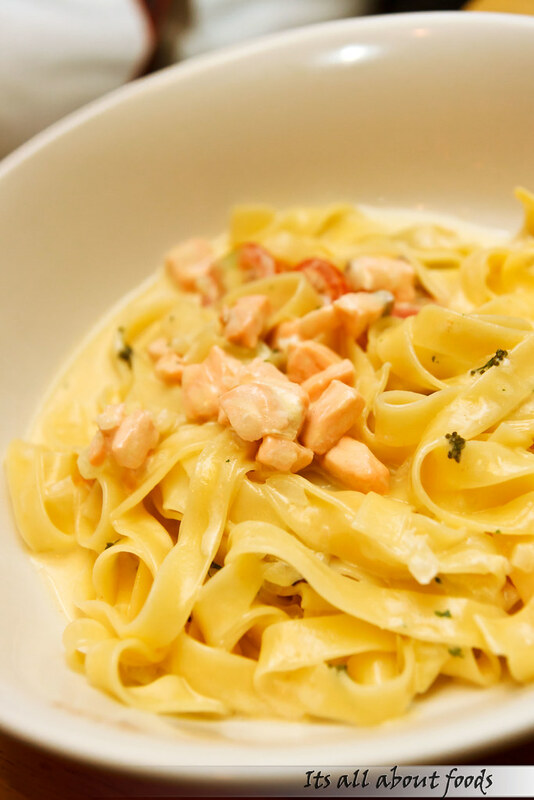 The cream base tastes lighter and less creamier but certainly healthier with the hearty chunks of salmon. 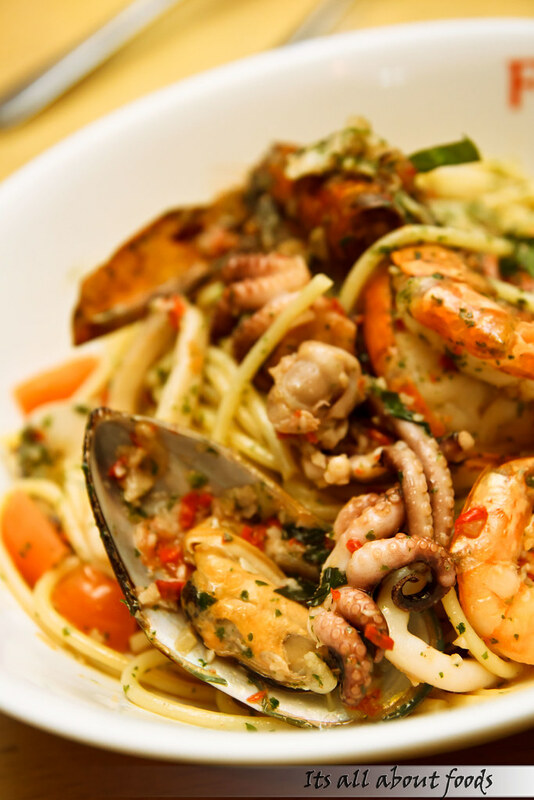 Slightly spicy and tossed with olive oil, this aglio olio style seafood spaghetti has a good portion of fresh mussels, octopus, clams, squid, scallops and tiger prawns. 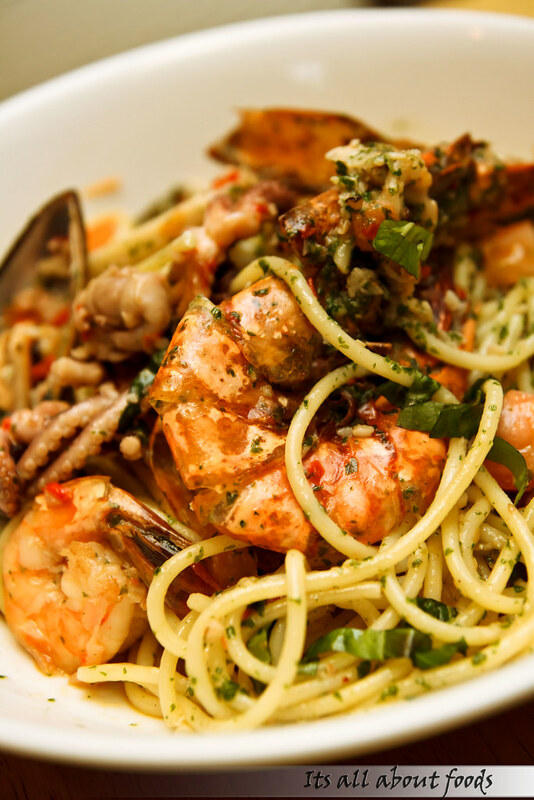 Whether you are a seafood lover or not, the taste will definitely get you hooked on. Need some meat? 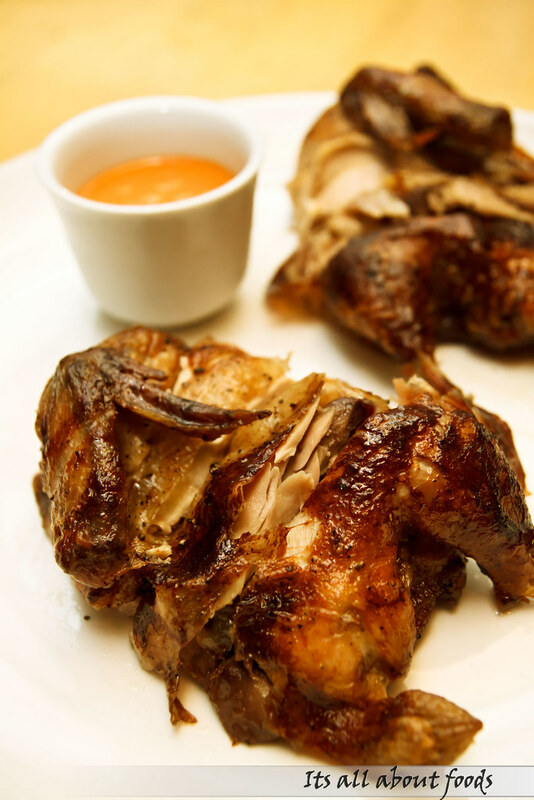 Go for a try on one of their signature dish——roasted spring chicken. The chicken comes in a choice of the chicken alone, or with side dishes. The spring chicken was well roasted, firm in texture and paired well with the special sauce that tastes a little spicy and creamy. Try a piece and you might want to have the whole portion to yourself. Asks FLAM’S to recommend their signature dessert, once, twice, or trice, they will still answering you “Banana Flam’s” without any doubt. True to say, banana Flam’s deserved the honour of being the signature dessert in FLAM’S. 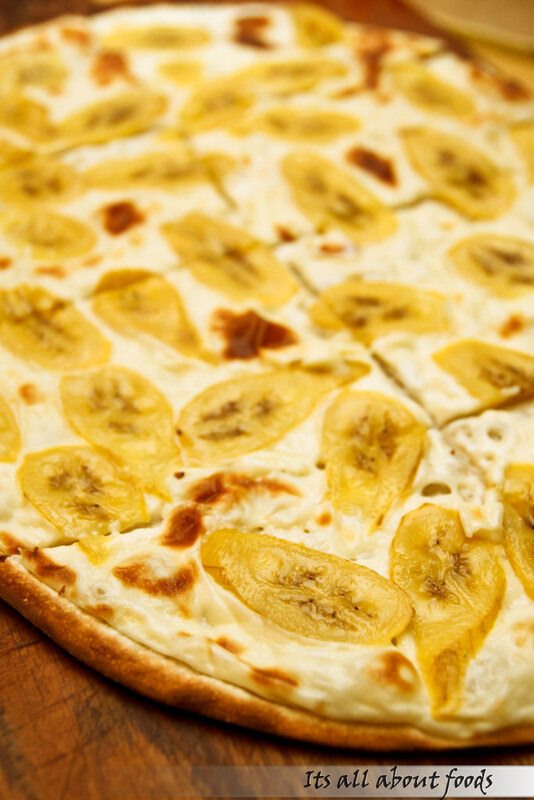 My girl always loves the banana and kaya pizza from one of the firmed pizza chains, but she says this one has scored well (& better) with its super thin crust, creamy cream and sweet banana slices. It looks weird but believe me, the combination is just so fantastic. OMG… pizza was calling me!